Here at The Bathroom Company, we like to have fun and a bit of a laugh! That’s why today’s blog post is all about the people who are shower singers and those who belt out a ballad in the bathroom! 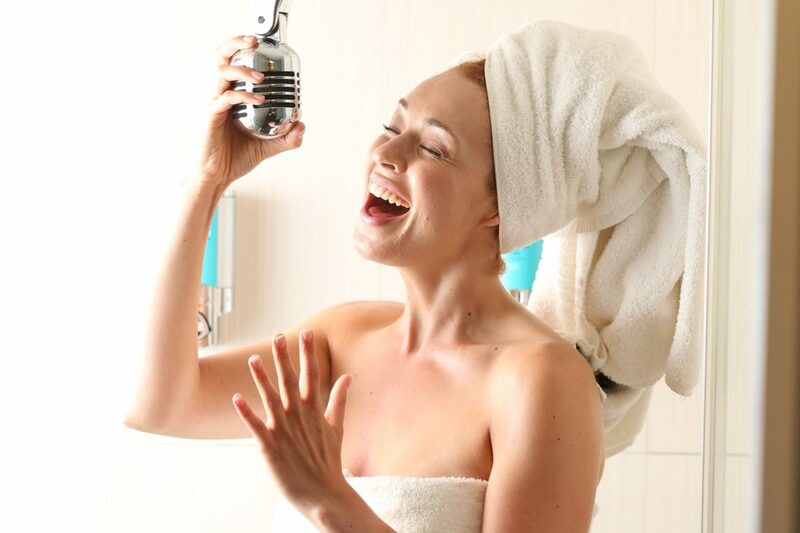 We all think that we perform to a pop star’s status in the shower and today we’re going to show you the 10 best songs to sing while you’re getting washed in the shower! We all love a bit of Whitney, especially when you can have a dance to her as well! Her legacy lives on through her songs and this one is no exception. Known to everyone as Queen Bey, this one of her most iconic songs where she harmonises like an angel! Get your vocal chords ready to sing those melodies back! All we have to say for this one is make sure that high note is absolutely perfect! It’s one of those songs where you give it all your power to sing! Unleash your inner Adele and think about a time where you’ve had your heart broken. Sing it like they’re missing something – YOU! We love a power ballad and one that’s (quite literally) full of heart. Time to get all emotional for this one and sing this one like you mean it! Let’s go back to the 1970’s and have a little disco moment in your shower! What a way to start any morning than belting out this absolute classic! Imagine being at a festival and hearing this song live. Imagine you’re Brandon Flowers on stage and singing this rocky number. All the inspiration you need! We love a little throwback and this is definitely a rock song worth staying in your shower for to sing! Air Guitar’s at the ready for that guitar solo! Finally, you’ve probably seen THAT scene with Joseph Gordon Levitt in (500) Days Of Summer where he takes to the streets dancing, practice those moves in the shower and get ready to sing and dance your day away! Here at The Bathroom Company, we have a devoted team who will help with your design, supply and install. We can help you with the finishing touches and give you the expert advice required to give you the bathroom that you have always dreamed of. Let’s turn it into a reality. Our stunning showrooms in Edinburgh and Perth have many displays for any size of bathroom. This entry was posted in Showers, Style and tagged Fun, Karaoke, Shower, Sing, Songs.